Museum-lovers will get to explore Frederico de Freitas Museum and Ethnographic Museum. Blandy's Wine Lodge and Ponta do Pargo Lighthouse are good opportunities to explore the local culture. Change things up with these side-trips from Funchal: Porto Moniz Natural Swimming Pools (in Porto Moniz), Miradouro da Ponta do Rosto (in Canical) and Ponta de Sao Lourenco (in Machico). There's still lots to do: get up close to creatures of the deep with a dolphin and whale watching tour, examine the collection at Universo de Memorias Joao Carlos Abreu, contemplate in the serene atmosphere at Igreja do Colegio Sao Joao Evangelista, and learn more about the world around you at Monte Palace Museum. To find where to stay, reviews, other places to visit, and more tourist information, read Funchal road trip site . Recife, Brazil to Funchal is an approximately 14.5-hour flight. Traveling from Recife to Funchal, you'll lose 3 hours due to the time zone difference. Expect little chillier temperatures when traveling from Recife in April; daily highs in Funchal reach 23°C and lows reach 17°C. Finish up your sightseeing early on the 7th (Sun) so you can travel to Angra do Heroismo. Angra do Heroísmo, generally known as Angra, is a municipality and city on the island of Terceira in the Portuguese autonomous region of the Azores. Appreciate the collections at Serra de Santa Barbara Interpretation Centre and Olaria de S. Bento. Explore hidden gems such as Museu de Angra do Heroismo and Monte Brasil. 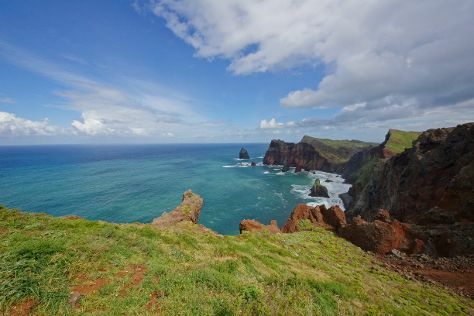 There's lots more to do: soothe aching muscles at some of the top local wellness centers, admire the natural beauty at Duque da Terceira Garden, take in the architecture and atmosphere at Igreja Da Misericordia, and admire the striking features of Imperio do Espirito Santo de Sao Sebastiao. To find more things to do, photos, other places to visit, and other tourist information, go to the Angra do Heroismo trip planner . Fly from Funchal to Angra do Heroismo in 7.5 hours. Due to the time zone difference, you'll gain 1 hour traveling from Funchal to Angra do Heroismo. Wrap up your sightseeing on the 11th (Thu) to allow time to travel to Tomar. Tomar, also known in English as Thomar, is a city and a municipality in Santarém District in Portugal. Deepen your sense of the past at sights like Shrine of our Lady of the Rosary of Fatima and Monastery of Alcobaca. Eschew the tourist crowds and head to Convent of Christ and Praia da Nazare. Change things up with these side-trips from Tomar: Castelo de Marvao (in Marvao), Igreja de Nossa Senhora da Penha (in Castelo de Vide) and Batalha (Batalha Monastery, Capelas Imperfeitas, & more). The adventure continues: get engrossed in the history at Museu Nacional Ferroviario, admire the masterpieces at Museu de Aguarela de Alfredo Roque Gameiro, admire the landmark architecture of Igreja e Convento de Santa Iria, and explore the historical opulence of Castelo de Tomar. For maps, traveler tips, reviews, and tourist information, read Tomar trip planner . You can do a combination of flight and train from Angra do Heroismo to Tomar in 7.5 hours. Due to the time zone difference, you'll lose 1 hour traveling from Angra do Heroismo to Tomar. April in Tomar sees daily highs of 22°C and lows of 11°C at night. Finish up your sightseeing early on the 15th (Mon) so you can go by car to Evora. Appreciate the collections at Monte da Ravasqueira and Centro Ciencia Viva do Lousal - Mina de Ciencia. Discover out-of-the-way places like Capela dos Ossos and Cathedral of Evora (Se Catedral de Evora). You'll find plenty of places to visit near Evora: eco Palacete Palma Borralho Relogio (in Cuba), Museu Mineiro do Lousal em Grandola (in Grandola) and Museu do Medronho (in Alqueva). 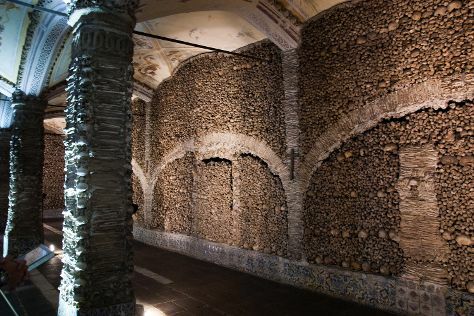 There's much more to do: contemplate in the serene atmosphere at Templo Romano de Evora (Templo de Diana), make a trip to Centro Historico de Evora, take in the architecture and atmosphere at Sao Joao Evangelista Church (Evora), and explore the ancient world of Almendres Cromlech. To find maps and more tourist information, go to the Evora trip maker app . Drive from Tomar to Evora in 2.5 hours. Alternatively, you can take a train; or take a bus. In April, plan for daily highs up to 24°C, and evening lows to 11°C. Finish up your sightseeing early on the 19th (Fri) so you can go by car to Albufeira. Eschew the tourist crowds and head to Praia dos Olhos de Água and Falesia Beach. Deepen your sense of the past at sights like Cape Saint Vincent and Cerro da Vila. Explore the numerous day-trip ideas around Albufeira: Old Town Faro (in Faro), Praia da Marinha (in Carvoeiro) and Lagos (Praia do Camilo, Praia Dona Ana, & more). And it doesn't end there: kick back and relax at Praia Da Rocha, take a leisurely stroll along Alvor Boardwalk, stroll through Praia Gale, and view the masterpieces at Olaria Pequena. To find ratings, reviews, traveler tips, and tourist information, read Albufeira day trip planning site . Getting from Evora to Albufeira by car takes about 3 hours. Other options: take a train; or do a combination of train and flight. Traveling from Evora in April, Albufeira is somewhat warmer at night with lows of 15°C. 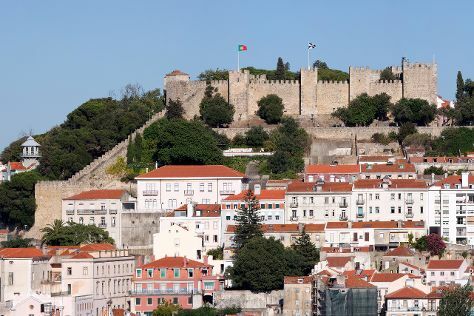 Cap off your sightseeing on the 24th (Wed) early enough to go by car to Lisbon. 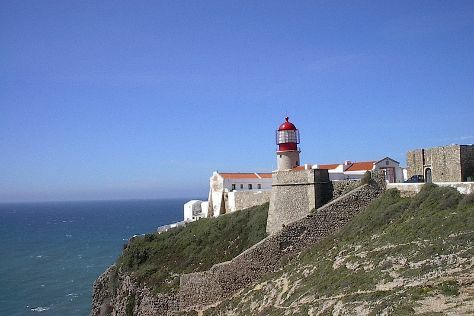 Discover out-of-the-way places like Castelo dos Mouros and Cabo da Roca. Popular historic sites such as Jeronimos Monastery and Park and National Palace of Pena are in your itinerary. Change things up with these side-trips from Lisbon: Sintra (Quinta da Regaleira & Sintra National Palace). The adventure continues: explore the world behind art at National Tile Museum, view the masterpieces at Museu Calouste Gulbenkian, wander the streets of Alfama, and appreciate the extensive heritage of Belém Tower. To find more things to do and more tourist information, refer to the Lisbon itinerary planning app . Getting from Albufeira to Lisbon by car takes about 2.5 hours. Other options: take a bus; or take a train. In April, daytime highs in Lisbon are 24°C, while nighttime lows are 13°C. Cap off your sightseeing on the 30th (Tue) early enough to travel back home.